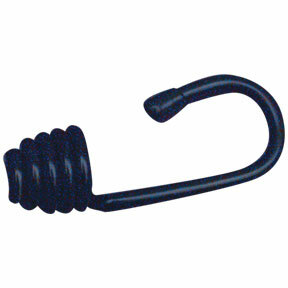 6/16" Black Metal Shock Cord Cone Hook. Painted for longer life and plastic tipped to prevent marking of adjacent surfaces. 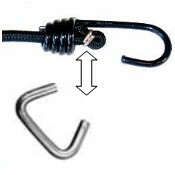 Use this product with Shock Cord and Stainless Steel Hog Ring to manufacture custom length bungee cords. 3/16" Bungee Cord will fit cleanly through the opening.